Full color PLUS put a message on the bottom! Made with neoprene, which means it is both latex-free and water resistant! 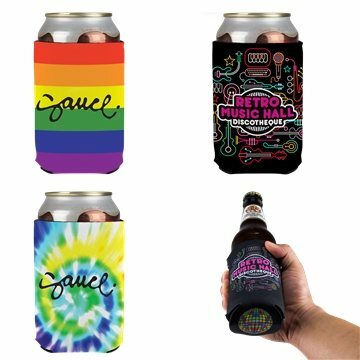 Holds up to 16 oz can or 20 oz bottle. All of them turned out wonderfully. Every single one of our clients enjoyed this product. Adorable and great give-a-ways...we liked the fun colors that we could choose from. Our item looked great! I ordered this for a recent conference and our attendees were really pleased with all the extra features. I loved the product. Great customer service! It looked exactly as I expected. The preview showed me exactly what I would be receiving. Our customer really loved the merchandise.